With a lovely coincidence of grace, the Novena of Grace through the intercession of St. Francis Xavier, S.J., begins on the same the day as the Roman Catholic Cardinals meet at the Vatican to begin the process of deciding on the Conclave. The Novena, which runs from March 4-12, 2013, presents an excellent opportunity for all believers of good will to unite, during the Year of Faith, with the great evangelizer, Francis Xavier, in asking the Holy Spirit to inspire the electors of the next Successor of St. Peter. Editor’s note: By another happy coincidence of grace, this Novena also ends on the date that the Conclave begins! If you haven’t been saying the Novena, jump in any time. The Holy Spirit isn’t bound by the calendar. 1633, far away from Asia and Japan, the Feast of the Immaculate Conception was being celebrated with great splendour in Cardinal Brancaccio’s palace at Naples, where vast erections for lights and rich curtains were raised even to the roof. In taking down these, a heavy beam chanced to fall upon the head of a Jesuit Priest, whom circumstances had long marked out for some unusual career. From childhood Marcello Mastrilli was accustomed by his parents to serve the sick poor as well as to give abundant alms, and from infancy his most earnest desire was to offer his life to God. At fourteen he knew himself to be called to the religious state, but as his father, naturally enough, opposed the idea, and wished to defer his going to a future day, young Mastrilli fled from his home, and took refuge in the Novitiate at Naples. Finding that his son’s convictions and maturity of mind far outstripped his years, the Marquis consented to his entering the Society, where he soon gave evidence of extraordinary virtue and spiritual progress. He chose St . Eustace and St. Francis Xavier as his patrons, and continually prayed to be sent on the Asiatic missions. For eight years however he was detained among the younger collegians, whose unlimited resources of teasing and persecution never brought out even an impatient word. St. Francis Xavier frequently appeared to him, offering him a pilgrim’s staff and a lighted taper, and signifying that the staff implied India, and the taper death by sickness, desired him to choose between them. Mastrilli always answered by saying, ” I choose that which God wills.” He had been fifteen years in the Society when he was struck at Naples by the falling beam, Brain-fever and delirium succeeded, and it was declared that his recovery was impossible. While, however, apparently unconscious to his attendants, Father Mastrilli received several manifestations from his patron, who appeared clothed in white with a crimson cross on his breast, and said to him : ” Oh! Marcello, tell me what you wish for, and remember that I am not now powerless in Heaven.” Father Mastrilli replied, as usual, that his only wish was to do God’s will. At the same time he asked St. Francis if those in white, whom he saw about him, were Japanese martyrs ? The Saint only replied : ” They are thy friends, and pray for thee.” Meanwhile death drew nearer and nearer, and the Provincial, Father de Sangro, came to visit and bid him farewell. 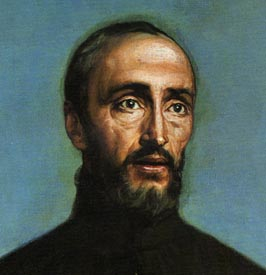 Father Mastrilli then asked permission to offer himself by vow for the Indian missions, for which leave was given, and begged that a famous picture of St. Francis Xavier, which had proved miraculous, might be brought to his bedside. He was then anointed, but could not receive the Viaticum as he was unable to swallow. Grieving very much at this deprivation, Father Mastrilli invoked St . Francis, and placed some relic of him upon his throat, after which he received Communion with ease. When the terrible news of Father Ferreyra’s apostacy reached Europe, there was nothing but one imploring supplication to the General of the Jesuits from his subjects to be sent to Japan, to expiate by martyrdom the falling away of their brother. Father Mastrilli was the foremost of these petitioners. When he went for permission the General replied: ” You need scarcely ask me for leave when St. Francis himself has given it to you.” He was made Superior of the band of twenty-three Fathers who went out; and after a long and dangerous voyage, during which the invocation of St . Francis Xavier preserved them from many dangers, they landed at Goa. Here the renown of Father Mastrilli’s cure made every one wish to retain him for that province, but nothing could restrain his apostolic zeal and thirst for martyrdom. He was allowed to open the shrine of St. Francis, and invest the Saint’s body with the magnificent jewelled chasuble sent out by the Queen of Spain, and was also permitted by the Provincial to take away for himself a handkerchief stained with blood, and a box containing a portion of the body, leaving also in the Saint’s hand a letter to himself. Father Mastrilli hastened on to Macao and Manilla, where the Governor of the Philippine Islands also wished to keep him, and would scarcely let him go on his way. The affection he awakened in every one who knew him reminds us of that conceived for his beloved patron, St. Francis Xavier, who made himself master of all hearts. After accompanying this Christian Governor, Don Sebastian Hurtado, on an expedition against the cruel pirates of the Malay Archipelago, routing them through the power of St. Francis Xavier’s name, and performing many other miraculous works, Father Mastrilli finally reached the goal of all his desires, and landed at Satzouma in Japan. The few timid and spiritless Christians whose bark had just touched the shores and put off again, soon betrayed his coming, for the long course of terrible sufferings had exhausted their faith and courage, and Father Mastrilli was found, after a brief search, praying in a thicket with his arms in the form of a cross, and much weakened by hunger. His face appeared so beautiful, and so shining with heavenly light, that the soldiers were about to adore him as a god, when he said gently : ” Come, my children, and take me.” They then approached and bound his hands with great reverence. Father Mastrilli was then carried by a guard of two hundred soldiers to Nagasaki, and in that former center of so much faith, so many virtues, and so great a crowd of penitents and martyrs, he was examined, condemned, and sentenced to the double torture of water and the ladder. During this trial all those present saw a bright light surrounding his head, and after shameless and terrible torture he fell into ecstasy, and was raised into the air shining with glory. During this time he repeated several times our Lord’s words: Spiritus eriim. Closely shaven and daubed with red ochre—the Japanese sign of infamy— gagged, and chained hand and foot on horseback, Father Mastrilli, a spectacle to men and Angels, was carried triumphantly through Nagasaki, and plunged into the fosse. There he again fell into ecstasy, and remained alive for four days with his blood in the ordinary normal state. On October 17, 1637, the Governor finding after repeated inspections that he was living and unchanged, ordered him, as a great festival was approaching, to be beheaded; and thus was fulfilled his own prophecy as to the manner of his death. At the third stroke, when his head fell, the air was darkened and the earth shook, and rocked to and fro, so that all the spectators were appalled. They hacked his body to pieces, burnt and crushed it into dust, which they cast into the air and into the river, that not a relic might remain. This entry was posted in Uncategorized and tagged Conclave, Novena of Grace, St. Francis Xavier. Bookmark the permalink.